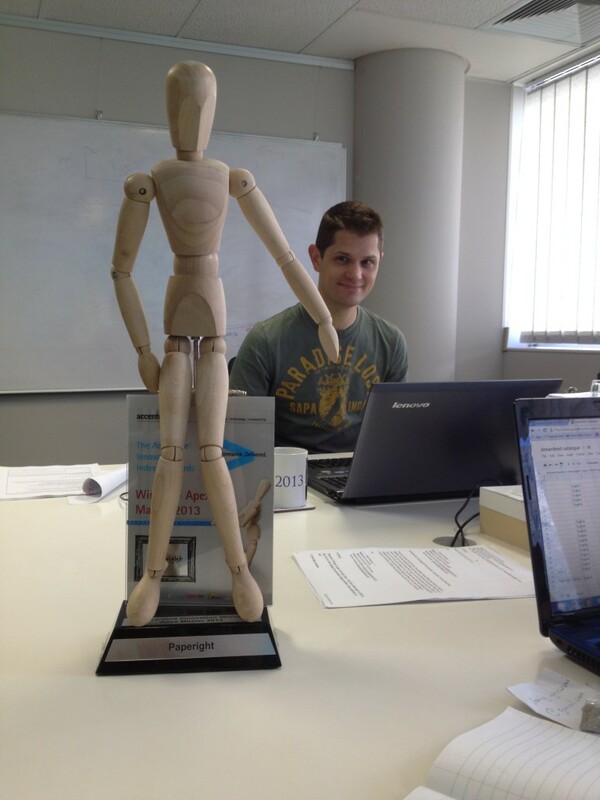 Arthur appreciating the Accenture Apex award trophy. Great news: Paperight won two massive innovation awards last week. Woo! Paperight took first place at the Frankfurt Book Fair Contec Startup Showcase in Germany last Tuesday, before we picked up the Apex award for the most innovative small company in South Africa at the Accenture Innovation Index Awards in Sandton on Thursday evening. The Contec Startup Showcase was held as a precursor to the Frankfurt Book Fair, the world’s largest and most internationally-represented publishing industry event. Paperight beat out competitors from around the world, impressing a panel of judges with both our technological innovations and our social mission. The Accenture Innovation Index Awards was launched to promote business growth and new enterprises in aid of job creation in South Africa. The awards were open to any organisation, irrespective of industry or size, and were judged on each organisation’s innovation ecosystem – from human resources to branding, from marketing to product development. Paperight was named as the winner of the Apex award, awarded to an organisation with an annual turnover under R40 million. The winner of the Zenith award, given to an organisation with an annual turnover over R40 million, was awarded to First National Bank (FNB). So, again, a massive thank you to our partner publishers, outlets and supporters around the world. We are changing the face of publishing for the better in South Africa and abroad. Previous Previous post: Paperight wins at CONTEC Startup Showcase at Frankfurt Book Fair! Next Next post: Book review: how we’re using GetSmarter to get better at photography!